I love having candles around my house, especially this time of year when it is still cold and dark. Lit candles (whether they be a real flame or a battery operated candle) can enhance the feeling or coziness, or what the Danish call “hygge,” in your home. If you are like me and like to change your candles up for different holidays and seasons, you know it can get expensive. 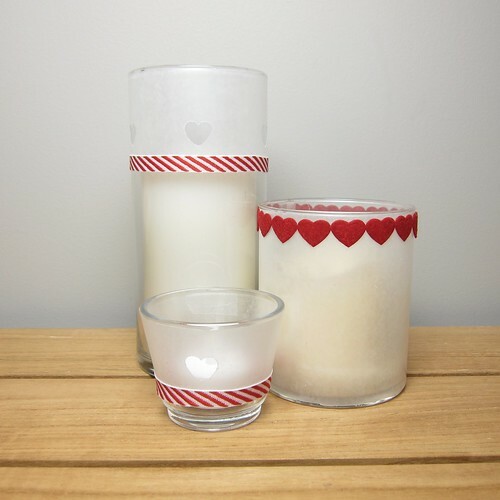 My trick is to take simple plain candle holders and dress them up temporarily. For Valentine’s Day this year, I used wax paper and ribbon. 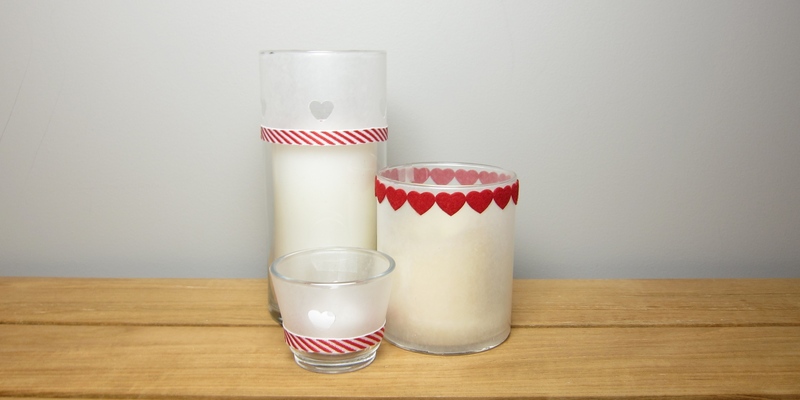 Double-sided tape holds the wax paper and ribbons on the candle holders. The wax paper softens the candlelight making the glass look etched without committing to anything permanently. Decorative paper punches cut out shapes for the light to shine through. I found the ribbon in the dollar section of Target, four different kinds on a roll for just $1. I really like the crisp look of these red and white ribbons. 1. 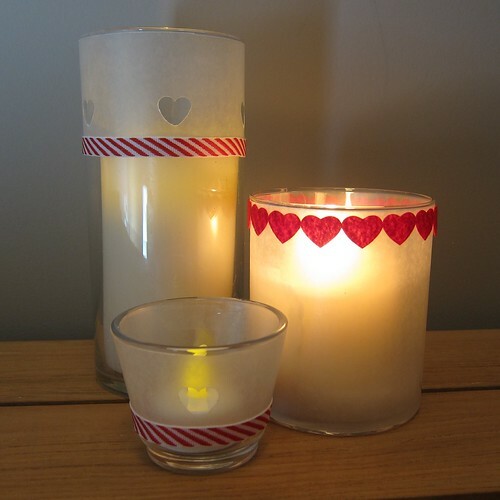 Measure your candle holder and cut a piece of wax paper to fit. You can cover the whole candle or just part of it. 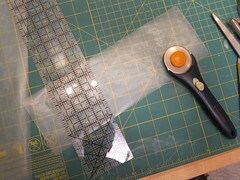 I found a rotary cutter worked best to get straight cuts. 2. Use a paper punch to stamp out shapes if you wish. I have to warn you, not all punches are created equal. This snowflake punch cut through cleanly with nice detail, but the heart punch struggled at the bottom point. I had to clean them up with an exacto knife. 3. 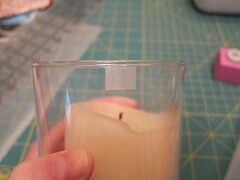 Cut small pieces of double-sided tape and place on the candle where the edges of the wax paper will meet at the back. I found it best to put a piece at the bottom and top of the wax paper. 4. 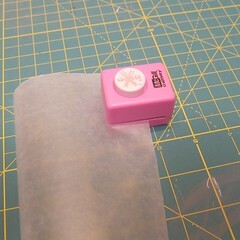 If using ribbon attach it with double-sided tape as well. 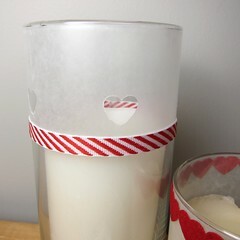 I think the ribbon gives a nice finished edge when you aren’t covering the whole candle with wax paper. 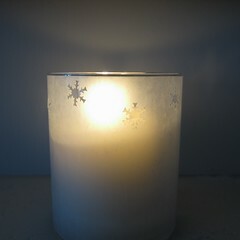 As well as the Valentine’s Day candles, I did some with snowflakes for winter. So simple, but I think striking when lit. When I am ready to change my candles up for spring, the tape and wax paper are easily taken off. 5 years ago by Kat in Craft Projects , Crafts , Holiday , Projects , Valentine's Day | You can follow any responses to this entry through the RSS feed. You can leave a response, or trackback from your own site. Great project. Stylish yet so simple. Just a point, if your punches are old and/or worn, you can sharpen them by punching through some aluminum foil. This can be helpful for the pointed ends like the bottom of your heart punch. It is always good to “sharpen” your punches before starting a project. Just an idea. This was a brand new punch. It does fine on paper, but seems to struggle with the wax paper for some reason. Cool project! And thanks for the tip on sharpening punches with aluminum foil.